This Weekend Rusted Gingham will be traveling to a spot in the road called Verdi- This is a worthy little spot as we will be part of Vintage in Verdi! The gals that host this are absolutely precious and we are glad to be there with them! Last year was downright 'bone chilling' but I am happy to say that the forecast for this weekend is in the low 70's for the high!!! Woot Woo!!! Verdi is just down the road from Pleasanton, Texas. So if you missed us at the Barn Sale- come out here and say Hello! 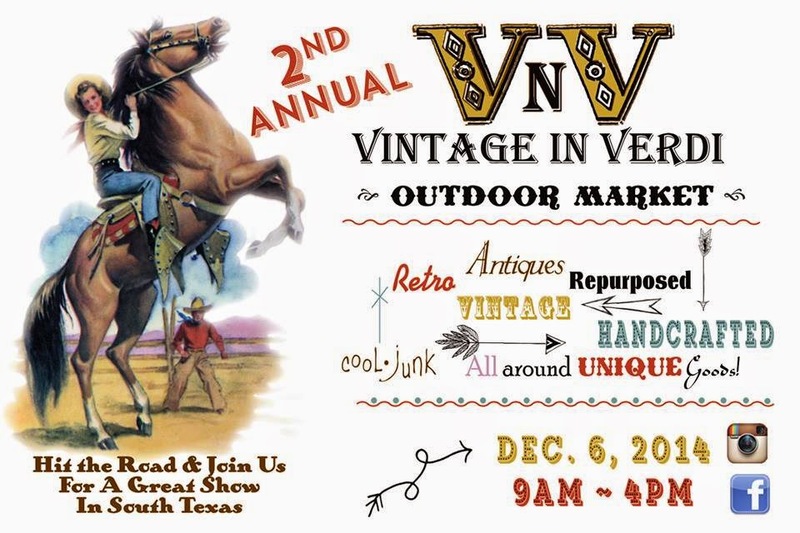 This year there promises to be a ton of cool vendors- several I am excited to say were at the Barn Sale- so maybe I can shop their Goods here in Verdi!!!! We are supposed to be toward the 'back' on an isle... look for our white tent with Rusted gingham goods all around! This was Kate and I last year at the end of the day- did I mention it was cold? How about 28° Cold!! Yet- there were shoppers all day- A fabulous turn out for a First time event and Blustery weather! The coffee and cocoa booth was rockin' last year- and I am sure they will be again this year! Hope to see you in Verdi!!! !